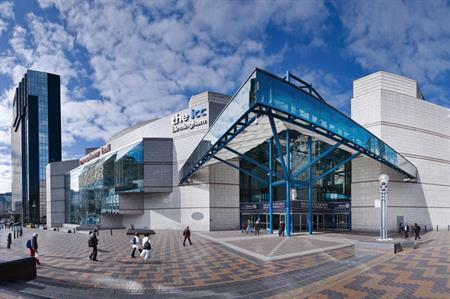 ICC Birmingham, where this year's annual meeting will be held. The British Ecological Society (BES) announced today the winners of its annual awards and prizes, recognising eight distinguished ecologists whose work has benefited the scientific community and society in general. Among the winners are Professor Josep Peñuelas from the National Research Council of Spain (CSIC), whose research on the biological impacts of climate change has led to the discovery of ecophysiological mechanisms linked to carbon and oxygen use that help to explain plant species distribution, as well as Dr Ruth Waters, Deputy Chief Scientist at Natural England, who has been praised for working alongside researchers, policymakers and the wider public to promote an ecosystem approach within UK conservation. It is the first year that the Society is giving the Marsh Award for Ecologists in Africa, which goes to Dr Chabi Adéyèmi Marc Sylvestre Djagoun from the University of Abomey-Calavi in Benin. Honorary membership is the highest honour the BES gives, recognising exceptional contributions at international level to the generation, communication and promotion of ecological knowledge and solutions. Other people that currently hold Honorary Membership include Sir David Attenborough, Dame Georgina Mace, Sir Charles Godfray and Sir John Lawton. Provided by the Marsh Christian Trust and administered by the BES, this is awarded for a current research record which is having a significant impact on the development of the science of ecology or its application. Provided by the Marsh Christian Trust and administered by the BES, this is awarded for an outstanding contribution to climate change research. Provided by the Marsh Christian Trust and administered by the BES, this is awarded for an outstanding current research record, largely completed in Africa, which is having a significant impact on the development of the science of ecology or its application. The BES Founders’ Prize commemorates the enthusiasm and vision of the Society’s founders. It is awarded to an early-career ecologist who is starting to make a significant contribution to the science of ecology. The BES Award is made in recognition of exceptional voluntary service to the Society and its community. This award recognises an ecologist who has bridged the gap between ecology and the public. This award recognises an individual or group who has made innovative contributions to enhancing the practice of equality and diversity in the ecological community. The winners will be presented with their prizes during a ceremony held at the Society’s annual conference in December, which will bring together 1,200 ecologists from around 60 countries to discuss the latest advances in ecological research across the whole discipline.